Rice flour, manufacturing at the highest standards. White rice flour is characterized by a high starch content of ±78 %, and contains hypo-allergenic proteins. Thanks to the ease of digestion of both rice starch and rice proteins, and the very interesting amino acid profile of the latter – being highly similar to the amino acid profile of breast milk – rice flour is widely adopted in baby food and infant cereals. Whole grain rice flour also imparts additional fibres and lipids. An important part of latter consists of unsaturated fatty acids. 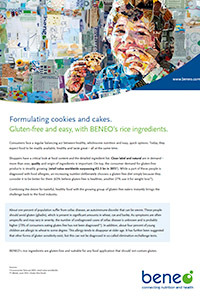 BENEO offers an extensive range of rice flours from different rice varieties with differing particle sizes and quality ranging from standards for baby food to organic, wholegrain and instant grades. Rice intended for BF-grade ingredients, is subject to a specific sourcing strategy executed in close collaboration with rice farmers and millers. Through a Full Supply Chain Control (FSCC) process, BENEO monitors rice and supply chain quality from field to farmer, storage and miller, including delivery at the production facilities. This process allows transparency of agricultural and primary steps in processing, starting on the field. The selection of BF rice and farmers/millers is driven by agricultural methods and best practices, such as controlled and recorded use of plant protection aids, stringent hygiene requirements during harvest, storing and handling as well as the highest achievable level of rice purity. This FSCC approach ensures that BF rice flours live up to baby food regulation and exceed today’s market requirements. Rice flour is especially popular in baby food thanks to its ease of digestion of both starch and protein, that in addition create pleasant and creamy textures. Excellent performance in gluten-free products. We have developed a range of micronized rice flours showing improved performance in gluten-free products like bread, cake and pasta over standard milled flours. Our native rice flour eliminates the need for a complex combination of multiple starch and flour types and keeps the ingredient list simple and clean. Rice remains a key ingredient for quality, gluten-free products (going head-to-head with their wheat-based counterparts). Our experts are happy to share gluten-free recipes delivering on texture, taste and with a strong nutritional profiles upon request. Texture impact in breakfast cereals and coated snack products. Using rice flours in extruded breakfast cereals has an unrivalled advantage. Thanks to the unique rapid hot-set properties of rice flour upon cooling, porosity of the cereals can be more easily controlled, crispiness enhanced and bowl life extended. When used in coatings of snack products commonly based on wheat flour, rice flour offers a gluten-free alternative and provides a significant beneficial impact on crispiness sensation, and adhesive properties of the snack coating. We offer various ingredient types with different qualities and specifications, including organic and clean label options. Our experts can help you identify the ideal solution for your specific application. For details ingredients information, take a look at our Ingredient Finder. Get to know rice flour better.